The night before Christmas is still and the fir tree stands tall and proud in the home. The decorated boughs stretch high to the ceiling, while the lowest boughs, large and long, cover the empty space that awaits Santa’s gifts. It’s the special moment when not a creature is stirring inside the house and the Christmas tree is the center of magic. For in the morning the kids will run out to the decorated silence, gleefully diving into the sea of wonder that sits underneath. Dancing around the tree, the children will purge through all the wishes left by Santa, glancing with confirmation at the cookies crumbs lining the plate and the glass of milk standing empty on the table. It’s the time when unabashed joy and pronounced love will abound while grownups stand around with a cup of coffee in hand, smiles on their faces, children squealing in delight. Recorded history shows plants and trees that were ever green held special meaning for people in winter. Evergreen wreaths and garlands were placed over doors and windows. Many believed the greenery held off evil spirits, ghosts, witches and illness from entering the home and was more likely the precursor to celebrating the wintry holiday with green trees in what we now know as Christmas. 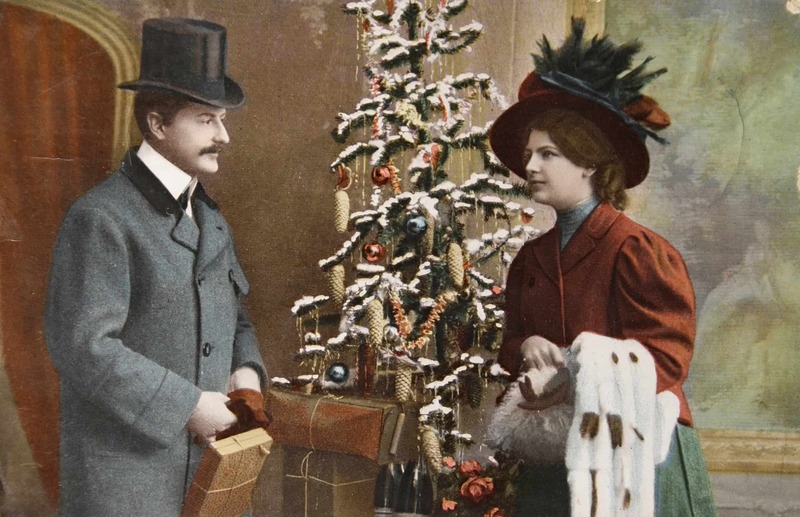 Vintage Christmas card circa 1915 shows the turn-of-the-century Christmas tree in Europe where most trees were 4ft tall. It was in the United States where trees from floor to ceiling were used. 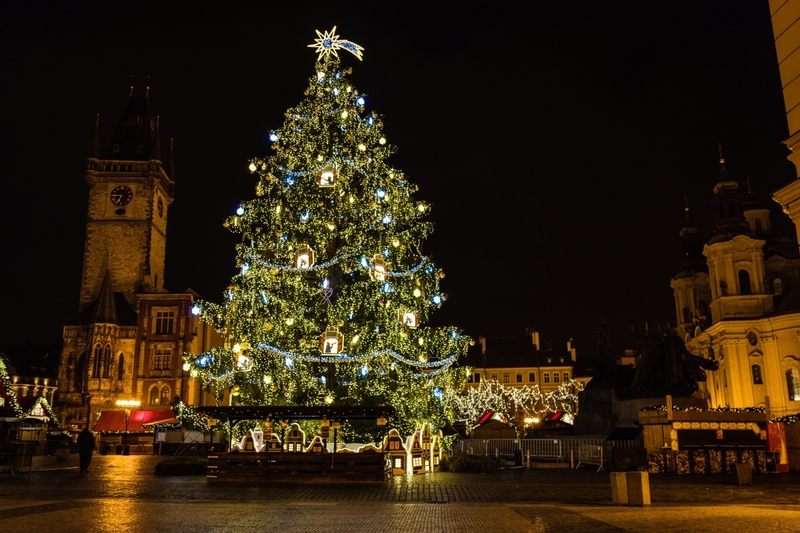 The modern Christmas tree originated in Germany during the 16th century Renaissance and today is called Weihnachtsbaum or Christbaum. It was typically decorated with roses made of colored paper, apples, wafers, ribbons and tinsels. Guildhalls carried the first evidence of decorated trees on Christmas Day and were decorated with sweets enjoyed by the apprentices and children. In Northern Germany during the early 18th century it was a common custom in town to have a Christmas tree, but not in the rural areas. The early 19th century saw the custom become popular among the European nobility, spreading to royal courts as far as Russia. It was during the start of the 20th century when the Christmas tree appeared in churches in its brightly lit form. There are German lyrics to a 16th old folk song that pay homage to the Christmas tree. “O Tannenbaum” was written in 1824 by organist, teacher and composer Ernst Anschütz and actually translates to “O Fir Tree.” The poem actually did not refer to Christmas or a decorated tree at the time. It made reference to the fir’s evergreen qualities as a symbol of constancy and faithfulness. But due to the Christmas tree’s growing popularity in the 19th century, it became associated with Christmas, the English translation shifting to “O Christmas Tree” and sung as a Christmas carol. 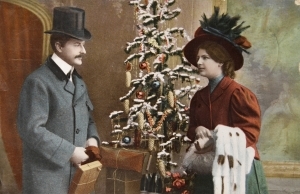 In the United States, the Christmas tree became a holiday item during the 19th century after the picture of Queen Victoria and Prince Albert and the rest of the British family standing with their decorated tree graced the pages of an American women’s magazine in 1850. It was in 1882 that Edward H. Johnson, vice president of the Edison Electric Light Company created the first known electrically illuminated Christmas tree at his home in New York City. By the early 20th century it became widespread in U.S. cities and department stores to place a Christmas tree outdoors for public viewing. The United States National Christmas tree has been lit each year since 1923 on the South Lawn of the White House and has become a major holiday event. Today, the Christmas tree symbolizes Christmas and with the influence of the 19th century poem, “A Visit from St. Nicholas” better known as “Twas the Night Before Christmas,” presents delivered by Santa under the Christmas tree has become the custom for the holiday we enjoy today. There are approximately 25-30 million real Christmas trees sold in the U.S. every year. The most common tree to be sold is the fir since it does not shed its needles when dried out and keeps good foliage color and scent. Some of the types of firs are the Douglas fir, Noble fir, and White fir. Almost all the trees are grown in commercial tree farms, typically cut after 10 years of growth. The tree from seed to about 6-7 feet in height takes as little as 4 years and up to 15 years to grow, the average around 7 years. Nurseries grow the trees from seeds until they are about 3 to 4 years old where they are sold to Christmas tree farms. ► 350 million trees grow on Christmas tree farms in the U.S. alone, all planted by farmers. ► They are grow in in all 50 states and Canada. ► Are a renewable, recyclable resource. ► For every tree harvested, 1 to 3 seedlings are planted the following spring. ► 350,000 acres are in production for growing Christmas trees in the U.S.; much of it preserving green space. ► 15,000 farms grow Christmas trees in the U.S., and over 100,000 people are employed full or part-time in the industry. ► The top Christmas tree producing states are Oregon, North Carolina, Michigan, Pennsylvania, Wisconsin and Washington.